Imperial Bullion trades and operates from its retail shopfront located in Hamilton just on the outskirts of Brisbane, Queensland, Australia. (a) Imperial Bullion is the service provider and supplier. (b) The term Bullion refers to all precious metals. The precious metals market is a constantly changing environment. Imperial Bullion diligently strives to keep website pricing and inventory of product current, however variances can occur. All orders will be confirmed prior to finalising the sale. Product pricing is based upon the relevant precious metals spot price and automatically update every 30 seconds. When buying online, the final price for an item is determined in the checkout and payment process. A bullion sale is a legally binding contract with Imperial Bullion under government legislation, and by purchasing from Imperial Bullion you accept all financial responsibilities and associated financial commitment with the order. If you have made a mistake, please contact Imperial Bullion immediately. In the event that we approve to cancel or amend the order you accept that any financial or market losses incurred by Imperial Bullion will be deducted from the deposit payment. Imperial Bullion has various fraud protection and security protections in place, and reserves the right to refuse any order at its own discretion, including extreme market events, and errors as a result of an electronic price feed or website issue, and shifting price market. Relevant customers will be immediately notified of any changes. You have 48hrs to initiate payment of your order via EFT or Bank Branch deposit. Orders over AUD $1,000 can only be placed with an account that has had the Identification validation process completed, as part of our internal anti-credit card fraud process. All Precious Metals dealers in line with AUSTRAC reporting requirements are required to identify their clients. Bullion sold in Australia or overseas is exempt from the Australian Goods and Services Tax (GST). GST is charged on freight, insurance and fees only in Australia – these services for international orders are GST exempt. These Terms and Conditions apply to you, the client, and your interactions and business with Imperial Bullion. On completing an order with Imperial Bullion, acceptance of these Terms and Conditions is mandatory, and you acknowledge this on placing a finalised order. When your order is submitted, the price of the bullion products is locked. You have no entitlement over any market gain in the event of a non-payment order. Orders are shipped upon receipt and clearance of funds, or after any stated delays and associated general processing time. Imperial Bullion is not responsible for typographical errors, and as stated above, reserve the right to void a sale at our discretion in the event of a market Force Majeure or extreme market volatility. Occasionally products may become out of stock, and if these cannot be sourced in a reasonable time period to replenish stock, the order will be cancelled and you will receive full refund for the purchased item(s) without any cancellation fee being applied. Imperial Bullion as an online merchant and precious metals dealer has extensive internal security processes in place to identify potentially fraudulent or suspicious transactions. Imperial Bullion reserves the right to void or cancel any order that does not comply with these internal security measures. We may offer an alternative method of payment, which if not accepted by yourself will see the order cancelled without any cancellation fee being applied. If fraud is discovered at a later date, Imperial Bullion reserves the right to commence legal action to recover either losses or product. A purchase of bullion from Imperial Bullion is final and cannot be changed as these products are immediately confirmed within the live bullion market. For Credit Card Payments over AUD $1,000, a client must be a ‘Verified” client. Imperial Bullion will request a copy of your licence showing the address on the shipping for the order. Credit card fraud is a major issue, so this Anti-Fraud policy exists for the benefit of both Imperial Bullion and innocent victims of fraud. Australian Law under the AntiMoney Laundering and CounterTerrorism Financing Act 2006 requires Imperial Bullion be able to validate the identity of its customers purchasing bullion products with a value over AUD $5,000 within a twenty-four (24) hour period. Orders cannot be shipped until the identification in the customer’s account has been validated. Imperial Bullion reserves the right to request individual or corporate identification for orders of any amount. Any purchases by customers on behalf of a business must also provide;(1) the full business name (if any) under which the customer carries on his or her business,(2) the full address of the customer’s principal place of business (if any) or the customer’s residential address; and(3) any ABN issued to the customer. For foreign registered companies, please provide:(1) Certificate of company registration issued by the relevant foreign registration body, and(2) A company statement including a listing of directors, and for private companies, a listing of shareholders, and(3) The individual identification documents as detailed above for the Director / Officer Holder nominated to operate the Imperial Bullion account. To complete an order, electronic copies of certified documentation is accepted, however the original certified copies MUST be forwarded to us by mail before an order can ship. Non-delivery of these ID documents will result in cancellation of your trading account and recovery of any applicable cancellation fees and / or metal prices losses as per this agreement. No bullion will be shipped until payment for the processed order is received in full and cleared. Shipping is via 3rd party courier services – Australia Post, Startrack, Fastway or DHL Express, may differentiate between individual orders. Where items are marked “Out of Stock”, some have backorders can be accepted and these will be organised with our suppliers. Set delivery time may vary due to the involvement of a third party, however Imperial Bullion will continue to focus of finalising delivery quickly. For orders that you would like to have held for delayed delivery, please select the combined orders shipping option. Multiple orders will only be shipped upon payment of a separately issued shipping invoice, unless the combined total of the orders qualifies for our “Free Shipping” offer. Imperial Bullion will not accept liability for the loss of an order once the delivery has been completed by the courier service. This includes if you have issued an “Authority to Leave” in a re-delivery attempt by the courier. All packages shipped by Imperial Bullion require a signature for the completion of delivery. Imperial Bullion will not accept liability for orders lost that have been signed by a third party at the nominated shipping address. It is important to note that courier services do NOT insure precious metals. Australia Post also does not cover bullion products however Imperial Bullion insures packages either by Australia Post or Courier services under our own Insurance policy. If Imperial Bullion is directly or indirectly prevented from making supply or otherwise performing an obligation, by reason of events beyond its reasonable control (including any force majeure event including restricted availability of input products of required quality, act of God, fire, earthquake, flood, lightning strikes, natural disaster, mechanical or electrical failure, industrial action or dispute, lockout, epidemic, war or act of war (whether declared or not), terrorism, revolution, malicious damage, sabotage, civil unrest or disturbance or action or inaction of any foreign or domestic government or third party), its obligations are suspended while it is prevented from doing so. Imperial Bullion will use all reasonable endeavours to terminate the event giving rise to delay but that will not include the settling of an industrial dispute on disadvantageous terms. Upon termination of the event Imperial Bullion must resume the performance of its obligations under this contract at the earliest date reasonable possible. We will not be responsible for any loss or damage incurred by you where we do not receive your instructions or where any dealing or proposed dealing is interrupted, unable to be completed or unable to take place due to the failure of any telephone, computer, other electronic or technological device. If you feel a package is damaged or has been tampered with upon arrival, DO NOT accept the package and notify Imperial Bullion immediately. Once you sign for the package, Imperial Bullion assumes no further responsibility or liability. Any products returned to Imperial Bullion in special approved circumstances, MUST be insured for their full value. All products shipped by Imperial Bullion, as part of our internal processes, will be videotaped to ensure that the contents of the package match the included paperwork. Returns are not accepted on bullion products unless incorrectly supplied or described. Please consider your order very carefully before ordering. As stated above, if a package appears damaged or tampered with, do NOT sign and accept it. Bullion coins and bars are supplied as investment products and supplied in original manufacturer’s condition. Imperial Bullion does NOT buy and sell within the second hand bullion market. We supply only NEW products direct from the associated Mint or their approved and appointed regional distributor. All personal information and financial details pass through a secure server using the latest 128-bit SSL industry standard encryption technology. Imperial Bullion uses Comodo Services to monitor and manage security. Imperial Bullion is not responsible for any loss or liability incurred by you, in any form of dealing with Imperial Bullion, except to the extent defined within Australian Consumer Law. By creating an account and using the services of Imperial Bullion, you certify that all information you have given is accurate and correct, and you have the full capacity to enter into, and meet the obligations pursuant to these terms. Imperial Bullion does not provide investment or trading advice. We supply investment related physical products in line with your personal and/or third party advised decisions. 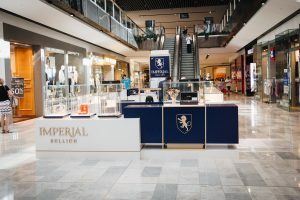 Information provided on the website or by the employees of Imperial Bullion is not investment advice. The purchase of bullion involves risk and all clients must complete their own due diligence. Imperial Bullion does not accept liability for any investment decisions.